The Immense Collection of Strange Acambaro Figurines: Evidence of Dinosaurs Living Among Us? Most mainstream paleontologists and geologists place dinosaurs on earth’s timeline at around 220 million and 65 million years ago, during the Mesozoic Era. Homo sapiens on the other hand, do not appear in the record until about 200,000 years ago - in the Middle Pleistocene, Middle Paleolithic (Eurasia), or Middle Stone Age (Africa). There are, however, occasional claims of evidence that dinosaurs and humans were not so temporally distant from each other, and in fact coexisted at one time. The bizarre Acámbaro figures are an example of this phenomenon. In 1944, the German shopkeeper Valdemar Julsrud claimed to have stumbled upon mysterious figurines while on horseback near Acámbaro in Guanajuato, Mexico. He said that he found over 30,000 of them with the help of a farmer. 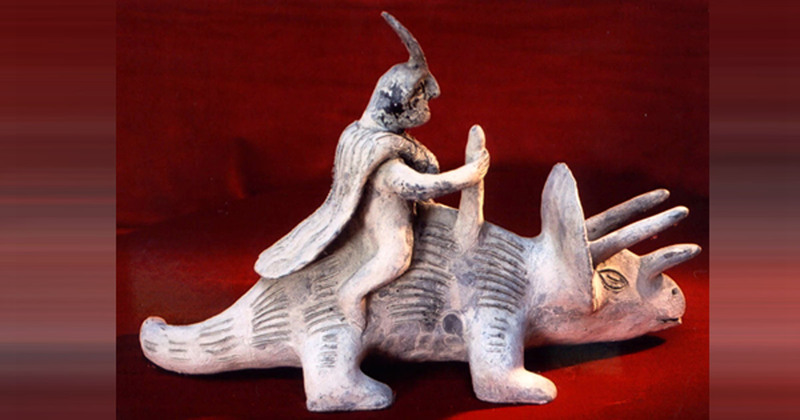 What is distinct about the figurines is that they appear to depict dinosaurs and humans living together. Additionally, there are also some strange figurines that many people say resemble flying saucers and even aliens. Most archaeologists have dismissed them as fakes because thermoluminescence studies and analysis of the artifacts’ surfaces reveal a very recent age. But these studies have not stopped those who are outside of the archaeological mainstream who have other ideas about the figurines’ origins. Those who believe that the artifacts are genuine can be divided into three groups: cryptozoologists who say that the figurines are evidence of a relict population of dinosaurs in the region who happened to come into contact with humans, those who believe that the figurines were left behind by interdimensional aliens who could travel back to the time of the dinosaurs and bring knowledge of them to Central American peoples, and young earth creationists who claim that humans and dinosaurs had to coexist to fit in with their interpretation of Genesis chapters 1-11 in the Bible. The first position is probably the most consistent with the mainstream view. However, none of these points of view matter much until you first examine the questions about the collection’s authenticity. On the surface, one of the main problems with the Acámbaro figurines being genuine is that there are few, if any, nearby dinosaur fossils. There are also no written accounts or oral traditions which speak of dinosaur-like creatures living in the area. It seems that if they were common enough for thousands of figures to be produced depicting them, the giant beasts would also show up more often in local traditions - just like jaguars and butterflies do. One website in favor of their authenticity states that there is no recent native pottery tradition in the area. On the other hand, if this claim is accurate, the figurines need not have been produced in the area either - even if they are just an elaborate hoax. In 1952, American archaeologist Charles Di Peso examined the artifacts and found that their surfaces showed no signs of weathering or collecting dirt in the cracks (that would have suggested that they were thousands of years old.) He used these observations to conclude that the figurines were not ancient. He also asserted that the family which had originally provided the figurines to Julsrud had been making them for a peso per item. Furthermore, the figurines resembled creatures and characters that the family may have seen in films at an Acámbaro cinema or from reading comic books available at a museum in a larger city nearby. These findings cast doubt on the authenticity of the artifacts. Thermoluminescence dating was also used on some figurines between 1969 and 1972. The analysis produced a date of about 4500 years B.P. (Before Present) placing the age of the artifacts around 2500 BC. Believers proclaimed this information as evidence for their authenticity. However, further studies in 1976 and 1978 revealed that the old date was erroneous and that the figurines did not meet the temperature conditions required for reliable thermoluminescence dating. The dates that could be attained revealed that the objects were from the late 1930s or early 1940s - shortly before they were “discovered”. Do the Ica Stones prove that mankind coexisted with dinosaurs and had advanced technology? Was the Baghdad Battery a medical device? Are the Figures Really Dinosaurs? These findings all cast doubt on the authenticity of the figurines. Another issue is that even if they are genuine, it is not clear that they are in fact depicting dinosaurs. For example, many of the figurines which are said to represent dinosaurs only have two legs - not the four legs that are normally associated with specific creatures. Some archaeologists have suggested that, if they are genuine, they might actually depict stylized non-saurian animals, or mythical monsters instead. It is possible that humans and dinosaurs did coexist, but this finding does not appear to be evidence supporting it. Even the prominent young earth creationist organization, Answers in Genesis , which would be very interested in any evidence for dinosaurs and humans coexisting has stated that this is probably a hoax. The results of the various studies suggest that the Acámbaro figures are not evidence of dinosaurs coexisting with humans - and thus they do not create problems for paleontologists and geologists saying that dinosaurs went extinct 65 million years ago, at the end of the Cretaceous period. At first glance, the Acambaro figurines do not appear to be genuine, due to the deviation from what would be considered the “typical” styles of the region during the time period in question. This is the standard, nearly automatic answer given by the vast majority of archeaologists when confronted by “atypical” findings, which go against the currently accepted theories. Insofar as verifying the authenticity of the artifacts goes, there are several basic “rule of thumb” techniques which can be used even by amateur archaelogists to determine if the objects “might” be authentic. All artifacts which have been the soil for periods of hundreds, or sometimes even thousand of years typically have indicators which may be used to “get a feel”, so to speak, of their possible authenticity. One of these indicators is the presence of “root marks” on the surface of the artifact. These are small lines on the surface caused by the root systems of nearby plants which have rested against the object and left their traces on its outer layer. Another method is the presence of Manganese deposits or “Manganese Blooms” on the surface of the piece. These marks are present in many ceramic objects which have been in the ground for a long period of time. Thermoluminescence is used primarily as a dating technique, and if done correctly is a reasonably accurate dating tool, but is only used when there is a high probability of the artifact being authentic, and possibly of great value. This is due to the highly technical, and very costly process utilized. Are the Acambaro figurines real, or are they fake? Until more research is done, the truth will not be known, but for me, with the evidence being what it is, I simply have to call fake. I do hope that I am proven wrong since verifying their legitimacy would turn the entire scientific community upside down. Something that I personally would enjoy watching. You two should look at the Ica Stones. Those are even more perfect and far more likely to be authentic, and there are tens of thousands of them. From one Alana to an Alanna, I agree. Too perfect. Too good to be true. The figures look too good to be true. Probably it’s just another trick to get attention. I am fairly familiar with the series of prints thatmake up the famous “Taylor Trail”, and in my opinion the supposed human footprints are simply a mis-identification of Therapod dinosaur tracks. There have been numerous studies done on the prints, and they all come up lacking any evidence to support the claim that they are of human origin. This, however, does not mean that the prints are a hoax. On the contrary, the simple fact that uncovering the tracks required the removal of much undisturbed strata above them throws the hoax idea right out the window. I concur that there is a possibility that at some point in history, dinosaurs and humans could have co-existed, but this find is not the “smoking gun”. As for the scientific community, and in particular, the news media, they can and will scream hoax anything which threatens their cozy little world.